We are saddened to learn of the passing of Jay Cross, a pioneer in the informal learning field. Jay was an ASTD Orange County presenter in the late 'aughts where he spoke, I believe, on what he called "time deflation" and its impact on learning, predicting a further reliance on eLearning as a training solution, and identifying a push for informal learning to support an employee's need to learn on the job. This presentation was unique (for our chapter) in that Jay delivered it from his boat anchored off the Central American coast while we listened in the DoubleTree Club conference room, simultaneously informed and inspired with new life goals. Jay was on a continuous quest for knowledge, the results of which you can glean from his continuously expanding digital footprint. You can learn more about how far-ranging Jay's quest took him from his Internet Time Alliance peer Harold Jarche. We would like to start by thanking each and every one you for your time, your attention, your perspective, and your obvious genuine interest in advancing the mission of the ATD Orange County Chapter. In July, we sent a survey asking for your input and insights into chapter activities, programs, and overall value. Click the link to find the final results and recommendations from the program survey. Thank you again for contributing to YOUR chapter and YOUR membership. Look forward to seeing YOUR programs in 2016. 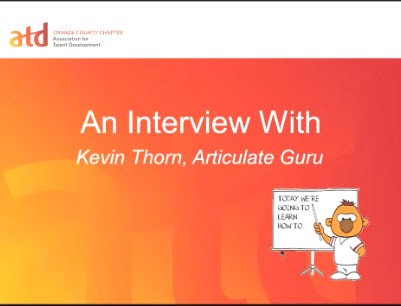 We asked Kevin Thorn, Articulate Community Hero and facilitator of this month's Articulate Fundamentals Workshop, what will you want you learners to be able to do by the end of the class? The answer surprised us. "By the end of the class," Kevin replied, "I want them to think differently about their designs. "If you think differently about the way you design and not try to design within a tool... if you think through the behaviour of what you want your learner to experience -- the user experience -- think about that first, design that, and I guarantee you Storyline can build what you want to design." In this "extended cut" from our Kevin Thorn interview, we hear more about his approach to eLearning design, and why pencil and paper are such important resources at this stage. You can listen to the extended cut here. Haven't heard the entire interview? Check it out here. More details on the Storyline Fundamentals workshop here. Kathleen Ashelford has had a long and storied career at ATD-Orange County. She joined us in 2009 with a passion for mentoring others, and dove in to support our ever-evolving Chapter Website. This year, she's our Chapter Past President. We sat down with her to learn more about her relationship with our community, and what's next for her and ATD-OC. You've held several positions at ATD-OC (formerly) ASTD Orange County. What was the first volunteer position you filled? As soon as I joined, I asked to volunteer. The Chapter was piloting a new program, and the team needed help, so I signed up. Shortly thereafter, I ended up leading the team. There are many opportunities at ATD-OC. What about that position appealed to you? Which position didn't matter. I just wanted to contribute, to connect with others, and to make a difference. Every role since has been an opportunity to do what I love - to help an organization grow its ability to serve stakeholders and fulfill its mission. Later, I worked on the Chapter website, and then served two terms as VP of Technology. We speak of the Past President as a single position, but in reality it's the conclusion of a three-year commitment in ATD-OC's "C-level." What skills did you feel you brought to this leadership level coming in? My previous work in software quality and IT involved much cross-functional facilitation, process improvement, and team development. It meant getting very diverse groups to work together. I'm a natural systems thinker, and good at creating collaboration, helping people to identify a common goal and integrating their expertise to reach it. What skills did you develop while serving as a Chapter President? I’ve learned things about leadership and true engagement that you don’t necessarily learn managing employees. Working with volunteers requires greater leadership skills. When I attended the 2013 ATD Leaders Conference, one speaker in particular impressed me greatly when he said, "when you manage employees, your first concern is what the organization needs from them. With volunteers, it’s the exact opposite. Your first concern is what volunteers need from their service." That was hard to get my mind around at first. Volunteers give their time and talents because they want to. However, as soon as they lose that desire, you lose them. The key is to learn what they want from volunteering - to develop a new skill, to find peers who can give advice and support, to increase their professional visibility - and help them get it. Also, anyone who has managed knows the difference it makes when people are truly engaged rather than working only for the paycheck. People give more of themselves when they are moved by something transcendent, something else they feel strongly about. I would like to increase understanding of this truth in the corporate world – that engagement in the real sense is always volunteered. Looking back over the past three years, what would you say is your greatest accomplishment while leading the Chapter? What was the Chapter's greatest achievement under your leadership? My team and I solidified the Chapter’s finances and operations, and laid the groundwork for transforming ATD-OC into a 21st century community of practice. As we did so, we took steps to elevate the importance of all volunteers and their efforts. Thanks to our predecessors, ATD-OC survived a long, deep recession. When we began our term in 2014, we saw the need for big changes. Short-term, we faced a projected revenue shortfall of $14,000 for the year. We had to offer more attractive programs, and improve our marketing and communications. All Board members took collective ownership for Programs, SIGs, and Total Trainer -- recruiting speakers, finding sites, marketing, everything. Thanks to my team – Jolynn Atkins, Javier Garza, Damion Donaldson, Kathy O’Halloran, Jeffrey Hansler, Sheri Long, Christopher Veal (pictured right) – programs and courses came together, and we filled seats. We ended 2014 with a $5,000 surplus, even after doubling investment in leadership development and marketing. Also, we redesigned the Board itself, created many new roles, including two new Vice President offices, Talent Management and Professional Development. And, we put new processes in place. Long-term, the challenges are those of strategy and vision. Our members today face a business environment very different from what it was 10 years go. Their needs are different. We began the process of deep discovery, questioning everything we do, and asking, “what kind of organization should ATD-OC be going forward?” The answer will take more than one Board’s term. Our current President, Jolynn Atkins, and President-Elect, Jeffrey Hansler, are moving us to the next stage of transformation. Two new Special Interest Groups (SIGs) have formed this year, and they are flourishing. Jeffrey has organized committees of volunteers to focus on Programs and Marketing, and other topics. How does the work performed in this position mirror the work that needs to get done in a training/OD department? The organizations we work for – our employers and clients – depend on OD, training, and other “people” practices to help them succeed. So must ATD-OC. Cultivation of strong, principled leadership is critical, as is the need to attract good people at all levels – in our case, members who want to participate in creating a community that meets their needs. This is why we created the role of Vice President, Talent Management. Sheri Long was the first, and made a great start in 2014, followed by Wendy Danbury in 2015. I look forward to holding that role in 2016, to build on what they’ve accomplished. Tell us a little bit about what you do specifically as Past President. What do you enjoy the most? What challenges you? The Past President ensures strong leadership succession and knowledge transfer for those who come after her: the President, President-Elect, and current and incoming Board members. This is a challenge, and I love it – especially working with Jolynn and Jeffrey. We three are of very diverse personality types and temperaments; our strengths complement one another, and we share the same vision and values. Our collaboration is one of the most powerful I’ve experienced. Things I wanted to do as President, but didn’t have time! For one, supporting Gloria Hays (pictured, right), Vice President of Professional Development, this year and next. She is the first to hold this role, and has made incredible progress with re-vamping ATD-OC’s courses, workshops, and other offerings. Under her leadership, Anthony Harmetz and I are piloting the Skills Development Academy. For years, members have been saying they want opportunities to develop specific skills, while receiving guidance and feedback from experienced professionals. Starting in early 2016, the Skills Development Academy will help them do that. We will communicate more about it very soon. Tell us a little bit about yourself. What do you look forward to doing when you face the day? How do you unwind at day's end? My undergraduate degree is in Comparative Literature - so, of course, I love to read! I have a Master of Arts in Organizational Leadership from Biola University, and chose that program for its emphasis on the spiritual aspects of leadership. My first job in the technology industry was writing software documentation at Xerox Corporation, where I made the leap into product development. After that, I wore many different hats in organizations of all types and sizes. My observations and experiences about why projects and organizations succeed or fail were what drew me to Organizational Development. I met my husband, Luis, when we were co-workers at Xerox. Through him, I rediscovered my girlhood love of science. He recruited me into the Los Angeles Astronomical Society. Studying the sky through a telescope shifts your perspective. Day-to-day stresses disappear when you see the vast, infinite creation, of which we are a tiny part. I give time to causes I care about. On my mother’s side, I am Lakota, a member of the Cheyenne River Sioux Tribe, hence my involvement with the American Indian Science & Engineering Society. Our mission is to bring more Native youth into the STEM fields. We emphasize the importance of education, but also of embracing one’s tribal values and culture. It’s another way to make an impact, to be a force for positive change. This month, on the ATD-OC Home Page, we asked our community to share their orientation experiences with us. You can see the poll results to the right. Or, if you haven't taken the poll, you'll see that instead. Why not share your answer now? The results were not surprising, with most respondents indicating: "What orientation?" followed by "Gave me a little insight into the company." This highlights a peculiar gap between an organization's hiring practices and their onboarding practices. Corporations are increasingly hiring people who they believe will fit within their culture. Highlighted as far back as 2001 in Jim Collins' Good to Great as the practice of "getting the right people on the bus," recruiters often seek out potential candidates who espouse the same values as the hiring organization. And yet, once that hiring process is over, so is the focus on the employee's "fit" within the organization. With 18% of talent professionals in our survey indicating that their orientation clearly explained their role, one wonders why that ball is dropped. Perhaps the gap comes from the push to reduce the time impact of orientation. The talent development team may face pressure from managers who state that a new hire doesn't have time for any new hire training that extends beyond the first day. Or the talent development team may be a "department of one," a taught shoestring able to get to orientation when a quorum exists for the class. A big component of Taco Bell's new hire orientation success story, as shared in our April 2015 Learning Event, was the reduction of new hire orientation from 30 hours to six with the implementation of just-in-time eLearning combined with on-the-job observation. With an employee turn-over of over 140%, this reduction of time was absolutely necessary for the rapid induction of their front line. Most orientations dive into the compliance rules. Because those are important. They explore the company benefits. Because the new employee needs to plan and prepare. They might provide an introduction to the other employees and facilities. Because we've all got to know where the facilities are. But that should be the tip of the orientation iceberg. "Understanding and being successful in the culture of an organization is the leading indicator of new hire’s speed to performance and retention," says Amy Hirsh Robinson in her whitepaper: "From Orientation to Acculturation -- What Really Belongs In Your New Employee Orientation." and "helping your newbies establish bonds with their peers and others in the organization"
You can hear more from Amy Hirsh Robinson and Angela Chang Tran, Learning Strategy Manager at Southern California Edison, this September 23rd as they share a case study of how Southern California Edison re-created New Employee Orientation to focus on employee ownership and connection. True to their model of new employee orientation, they're planning an interactive event, so book your seats today! Vote!! The Polls Are Now Open! The deadline to vote is Monday, September 14 at 9:00 p.m.
As a member, it is important that you exercise your right to vote for our chapter leaders. Candidate statements are available for your review online at www.atdoc.org >> About Us >> 2016 Board of Directors Election. Any write-in candidate(s) must meet the qualifications as stated in the bylaws to be elected. It's your choice. It's your right. Click the image below to go directly to the ballot and exercise your right today! Thank you in advance for your participation in this crucial part of our Chapter's health! For questions about this election, please contact Kathleen Ashelford, President-Elect 2015 at PastPresident@atdoc.org. In less than a week, we'll be sharing insights and business cards with others in our talent development community. If you're a dutiful networker, you'll take those precious 3.5 x 2" pieces of cardstock home, compose a few notes about your conversations, and reach out to one or two of those people within the next few days. And then what? If you're like me, even if you don't follow those networking steps properly, you've got a pile of business cards sitting in a drawer somewhere, or on top of your desk, waiting for appropriate entry into the contact management system of your choice. Today I learned about Evernote Scannable, and I can see its potential to help me with my post-network routine. First: what is Evernote? It's a cloud-based workspace that's great for taking notes, saving snippets of web articles, even collaborating with teammates. This article was written on Evernote before it got posted here. It's a dominate program in a market that's continually finding new players. To keep on the cutting edge of that market, the folks at Evernote continue to develop new features that will support your productivity. Evernote's Scannable app looks to have come into their toolkit January of this year. It uses your smartphone's camera to take a snapshot of a document -- any document. From there, you can share the scanned document via email or message, save it into your Evernote workspace, and a bit more. We've embedded their introductory video to help give you a clearer picture of what it can do. How can this help you with your networking? Around the 20 second mark in the video they show one person handing a business card to another. The recipient uses Scannable to take a picture of the business card, and from there save the card information to their phone's contacts list. Want to add some notes before saving? You can do that as well. I've done this with three of the business cards I've had on my desk at work. It was smooth and intuitive, and (dare I say) just a little bit fun. PLUS, if you connect the Scannable app to your LinkedIn account, Scannable allows you to send your contact info to that other person, and invite them to connect with you on LinkedIn. Evernote Scannable is free (as is a basic Evernote account), so download it to the smartphone of your choice and take it for a spin over dinner this August 26 with your talent development community! What apps / software do you use to support your networking efforts? Will you try Evernote Scannable when you attend your next Learning Event? A little word association activity for you. What comes to mind when you read... "Membership?" Anita Goldin, the ATD-OC Vice President of Membership, hopes that some of the words that pop into your mind are: "community," "relationships," "network," and "benefits," among others*. We interviewed Anita to get some insight into this vital role within our Chapter, and to see how performing this role has impacted her on-the-job skills. Tell us a little bit about what you do for ATD-OC. What do you enjoy the most? What challenges you? My focus this year has been to get an orientation program going and to support our community by driving involvement. Working with a board is an exciting venture. Building relationships and working as a team to accomplish our goals is fun. As a solo entrepreneur whose only office mate is her dog, I appreciate the opportunity to work with a team. Balancing my workload with my ATD role can be challenging. My business is very busy right now, so finding time to attend meetings and SIGs can be a struggle. Happy to report, I haven’t missed an MLE yet. What skills do you feel you brought to this position coming in? The strongest skill I bring to this role is probably my ability to make people feel comfortable and to build relationships. When people are made to feel welcome, they relax and thrive. Coming from the hotel industry, hospitality & service are in my blood – so this role is natural to me. How does the work performed in this position mirror the work that needs to get done a training/OD department? I think being organized and setting priorities is key when working on a board or within a training department. There are many opportunities at ATD-OC. What about this position appealed to you? I love being part of a community and building relationships. When I was involved with ICF, I made some fantastic friends and business connections. At ATD-OC it is the same. I want to share that opportunity of building a strong network with others. From a professional standpoint, I also saw the position of membership as an opportunity to build my own network and drive my business. And I am happy to report, this position has increased my visibility and impacted my business positively. Tell us about the team you lead. Who are they? What skills do they bring to the team? One of the things I have enjoyed the most is working with my Membership volunteers. We are a growing team of 6 members. Fabia Bianco – assists in calling new members, expiring and expired members. Fabia is a delight to work with: great training background, but most importantly a warm and gracious personality. When not working her 3 year old son keeps her very entertained! Ola Fadel - assists with calls too, but her main focus is to develop and build out the Ambassador Program. Ola brings to the group a great project management background. Ola loves traveling and visiting new countries, food and cultures and learn new languages. Joyce Douglas - has jumped right in and has been assisting with new member calls the Ambassador Program. A wonderful addition to the team. Marie Medina - a valuable part of the team has volunteered to wear many hats. She is currently involved in the Ambassador Program development, assists with member calls and is slated to help out with the volunteer recognition event. Marie enjoys discovering the unique qualities of each individual, and in helping people identify and build upon their strengths. Cortney Radusovsky – a new member who raised her hand high at New Member Orientation to get involved. She is interested in recruiting student members on Campus. We are excited to have her join our team. Nikki Chin – Is the newest addition to the team. We are looking forward to meeting her soon and learning more about her passions. I was born and raised in Massachusetts. What most people don’t know about me is that my background is in animals. I have a degree in Animal Science from University of Massachusetts and worked with animals the first seven years of my working adult life. Then I shifted gears and got into hotels, and then eventually human resources. I landed in California in 1996 when I transferred to Los Angeles with Hyatt Hotels as their HR Director. I started my own Coaching and Leadership company in 2006. What I enjoy most in my work is truly the diversity. No day is the same and I am the master of its design. I love going to client sites and working directly with people. I am a social animal, so I thrive on relationship development. My business is a combination of training and development, leadership coaching and team-building (the fun stuff – outdoors mostly). Now at the end of the day -- not sure when that starts -- my new 1-year old Australian Shepherd rescue gobbles up much of that time. She’s the definition of a high energy puppy. I love hanging out with my husband Carlos, drinking wine, eating good food and lots of chocolate. Cycling, swimming, I enjoy the outdoors. I’m also part of Style Laughter: an improv troupe that does performances to raise money for charities. Last month we performed in Santa Ana at Original Mike's and raised $600 for Nepal Victims. An ambassador program (welcoming new members and guests to the MLE’s). A focus group to hear from our members what they are looking to gain from ATD-OC. A Campus Recruiting effort to get students involved before they graduate and need a job. Want to get to know Anita a little better? You can find her at our next Learning Event, greeting and networking with our members. If you can't wait until then to learn a little more about the work Anita's team is doing to enrich our community, visit our Membership Benefits page.